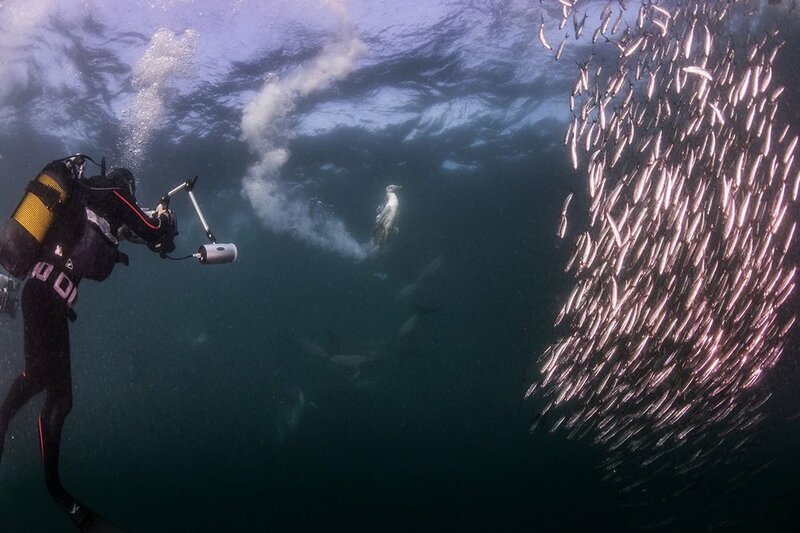 The Sardine Run in South Africa is one of the world’s top wildlife spectacles, and each year during May, through July vast shoals of sardines leave their normal cold-water home in South Africa’s temperate seas and travel northwards into the sub-tropical seas ofSouth Africa’s Wild Coast. 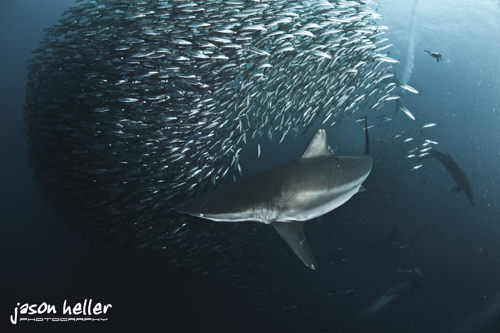 Following the shoal is a caravan of predators, seabirds, sharks, game fish and marine animals with little else but sardines on their mind. 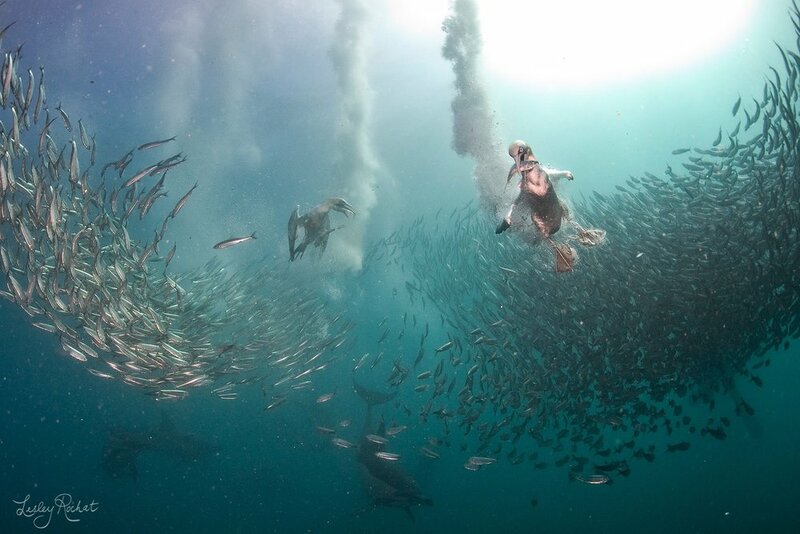 Thousands of common dolphins charge after the shoals, separating them into densely packed bait balls. Easy picking not only for them, but also for schools of hundreds of bronze whaler, dusky and black tip sharks which attack the bait ball from below. 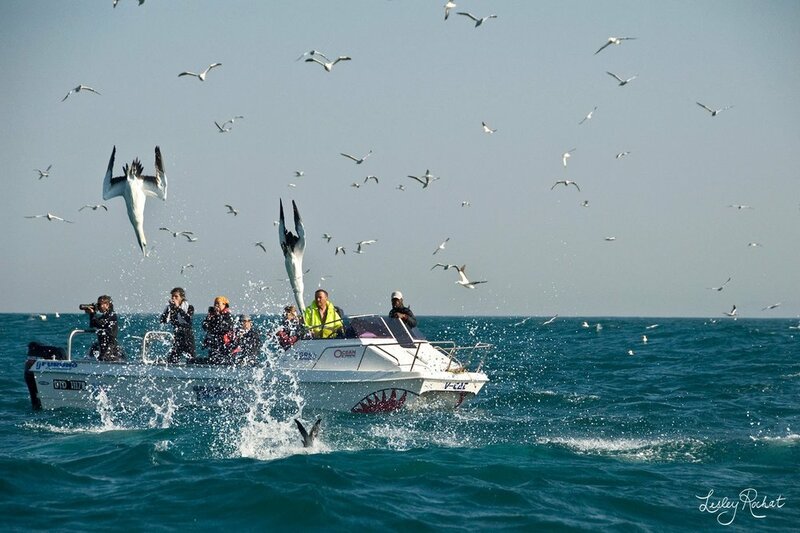 The aerial assault on the sardine begins when thousands of cape gannet begin their spectacular plunge diving display. Join your host Eli Martinez and your skipper (fellow shark expert), Walter Bernardis, who will be one of your dive-guides on this wildlife spectacle.This is marine wildlife watching at its most spectacular, a once in a lifetime opportunity to be part of something that many of the world’s top wildlife photographer and filmmakers consider the most intense and spectacular marine wildlife event in the world. 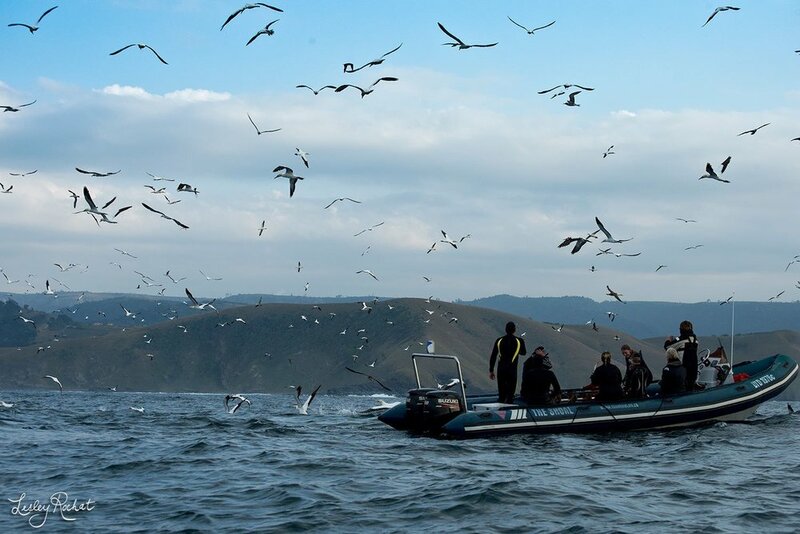 Our host operator has 20 years’ of experience in the sardine run, don’t miss this opportunity of a lifetime. Day 1: On arrival to Durban, you will be met by our local operator and transferred down to Mbotyi River Lodge which is an approximately a 5 hour drive. Pick up time will be between 11-12 noon, as we do not like to drive on the roads in the dark. Once you will settle in, you can prep your gear for the next day’s action. Dinner will be at 7PM. After dinner we will discuss the next day’s plan with your skipper and Micro Light Plot. They will have a good idea of where and what the action has been and will make a few recommendations to choose from for the morning for us. Day 2 – Day 6: We will spend the next 5 days in search of Sardines. 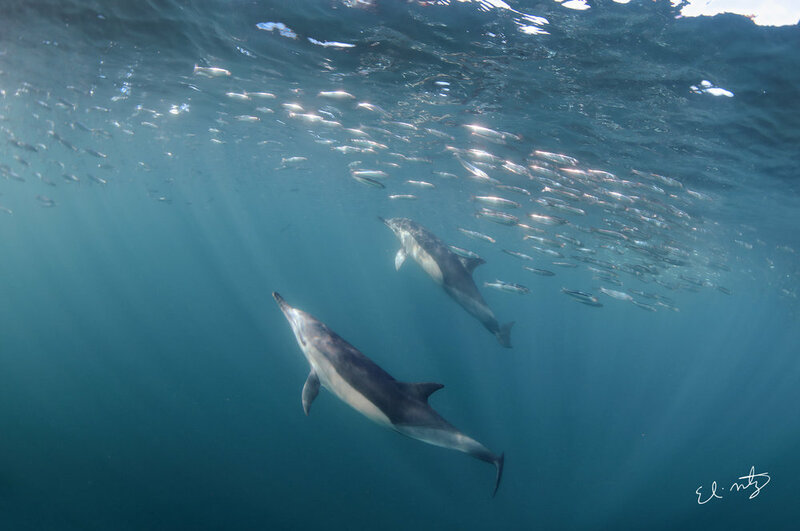 The aim is to locate shoals of sardines to view the feeding activity of dolphins, seals sharks and migrating humpback whales. The launch is approx. 6:30 to 7:30AM (depending on the light and breakfast). You will return every afternoon to your accommodation for a hot shower, dinner and to share some photos and storytelling of the day’s action. Day 7: Transfer you back to Durban International airport after breakfast for your journey home. Or elsewhere if you plan to extend your stay in Africa. Mbotyi River Lodge, is a 3 star rated family hotel and holiday resort on the stunning Wild Coast in the Eastern Cape of South Africa. Pondoland’s best kept secret is situated at the mouth of the tidal Mbotyi River nestled between the rolling hills, lush tropical forest and the warm Indian Ocean. 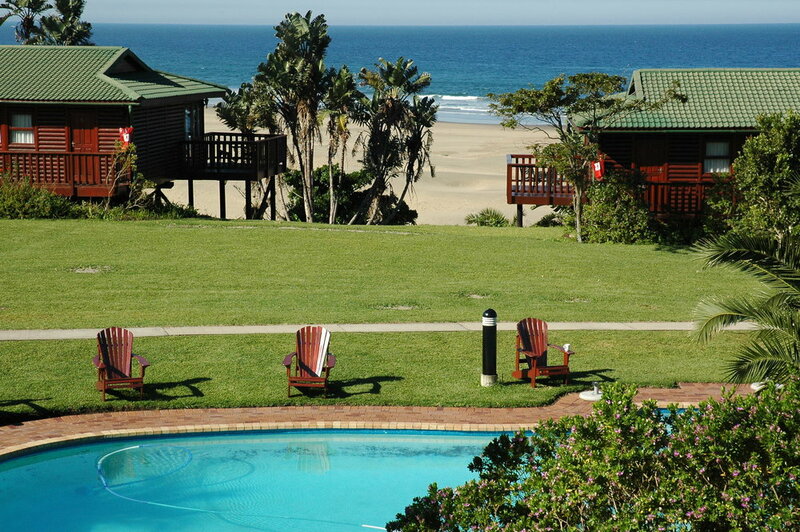 This unique Wild Coast hotel is the perfect place for a peaceful, tranquil holiday or for the more adventurous traveller wanting to experience the many amazing natural treasures like waterfalls and forests this coast has to offer. Let us know your interested in more information.